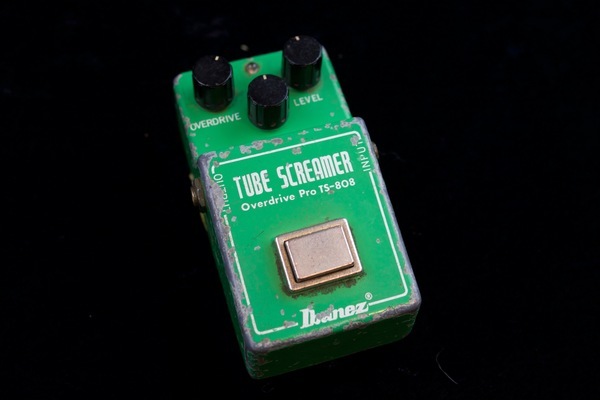 The Iconic TS-808 Tube Screamer is produced by Ibanez. The classic overdrive pedal used by countless musicians. Ibanez has released various pedals within the Tube Screamer line, starting in the 70’s with the TS-808 and followed by the TS-9 80's, The TS-808 has been reissued in various forms and is in production today. Known for it’s warm overdrive tone, and a distinctive mid-range boost, the TS-808 has made it a favorite among blues and rock players. 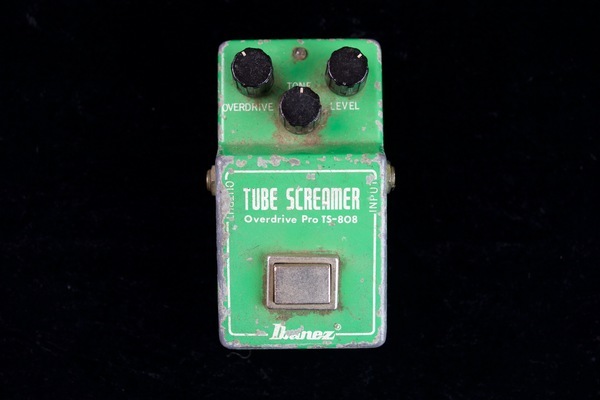 The Ibanez TS-808 Tube Screamer released in late 1970’s discontinued in early 80’s. The TS-808 reissue faithfully reproduces the original using the JRC-4558 chip. The pedal produces a classic sound of an overdriven tube amplifier. The pedal has basic controls a level knob, Tone knob, and overdrive knob. It’s sound is known for its mid-boost and medium drive. Closely associated with Blues and Rock players such as Stevie Ray Vaughan, and the Edge of U2. The TS-808 gives a very warm sounding overdrive. It is even and smooth even with the tone knob all the way up. The gain can be very subtle and be just a boost to the signal up to a bluesy crunch so closely associated with Stevie Ray Vaughan’s sound. By rolling the volume knob of your guitar the gain reacts in tone giving a wonderful dynamic quality and responsiveness. Very well made, metal case, and has the distinctive square lever that acts as the bypass switch. The example used for the demo has clearly had a long life on the stage, and has great character from the wear and tear of it’s age, but has not lost a bit of it’s tone. 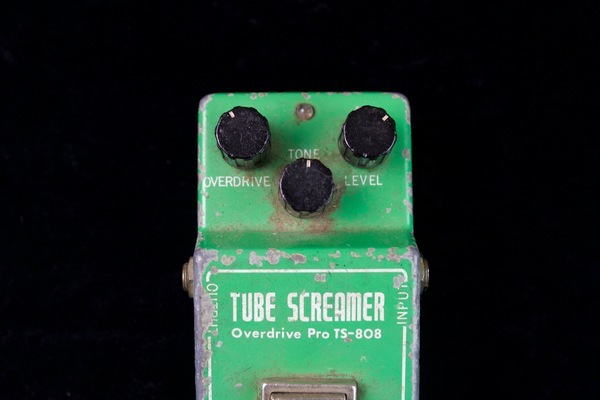 The TS808 was the original tube screamer creating a long lineage of models to follow it. The pedal stands out by it distinctive green paint color. Later models used other IC chips through the years, and various case designs. 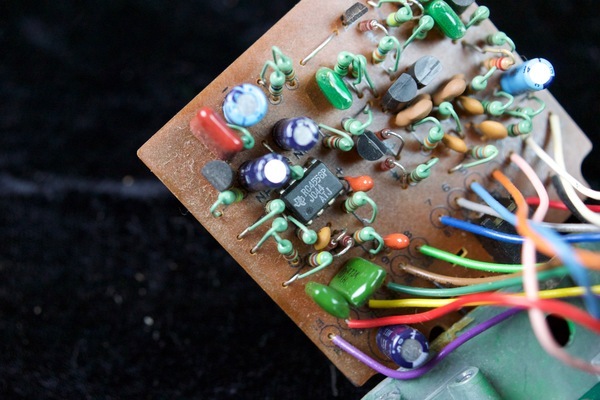 The original TS-808 is a very collectible pedal. Auctions on Reverb and Ebay are reaching up to $1000 depending on the condition. There are several reissue models that are in production and available online and through retail stores. The tube screamer was designed by Mr. S.Tamura. The Tube Screamer uses electronic field-effect transistor (FET) bypass switching. The circuit uses transistor buffers at both the input and the output. The overdrive is produced using a variable gain operational amplifier ("op-amp") circuit with matched diodes in the feedback circuit to produce soft, symmetrical clipping of the input waveform. The overdrive stage is followed by a simple low-pass filter and active tone control circuit and volume control. The sound is closely associated with the use of the JRC4558 IC chip, although different chips have been used through the years also. 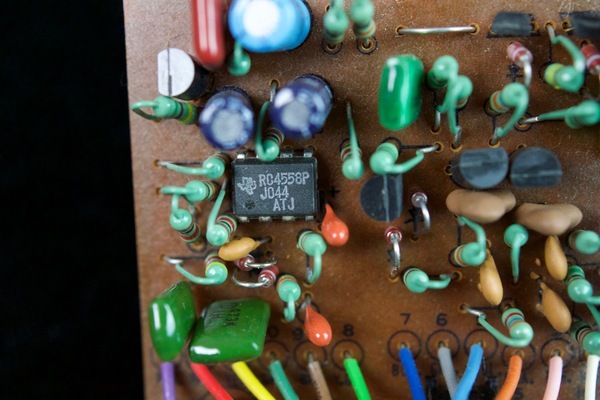 The Pedal reviewed here has a JCR4558p chip. This was one of the best sounding pedals I have ever had the pleasure of playing through. I can see why they are fetching such a hefty price.